I am a girl that loves something around her neck, be it a necktie, stacks of necklaces, the arms of my nieces or perhaps a certain Mister… But at the moment I’m looking forward to wearing one of my favorite accessories in the coming months — the winter weight scarf. 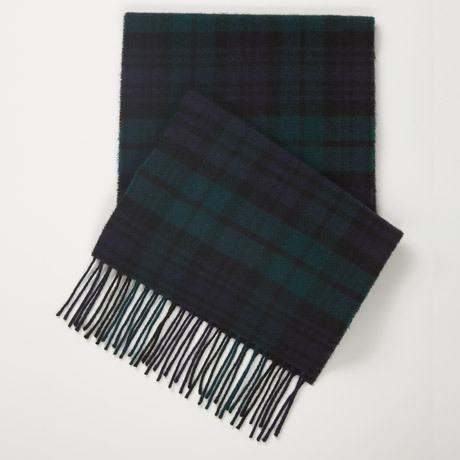 A lover of scratchy wool, my most special wool scarf is a light blue tartan that belonged to my grandfather, but this fall I am a bit obsessed with blackwatch, and so I have my eye on the lambswool beauty shown above from J.Press. At $49, it won’t break the bank, but if you have a bit more room in your budget they do have a cashmere one for $140. Adorable! Haven’t heard about J Press until now. thanks for sharing! You are currently reading Fall Staple: J.Press Blackwatch Scarf at Quite Continental.